tofu and avocado soup: sometimes, less is more. tofu and… avocado? has the poor man finally lost his mind? while the answer to that question might be “yes,” this is still a pretty dang tasty recipe i threw together the other day. i am a firm believer that some of the world’s best soups are those that are just as good hot as they are cold, which is certainly the case of some of my favorites. this soup in particular was inspired by none other than vichyssoise, one of america’s most classic soups. as with some of japan’s greatest foods, the key to this soup is its mildness. it contains no shocking flavors, no expensive ingredients, and requires no complex cooking methods at all. literally any person with a food processor or a blending wand can make it. and therein lies its beauty. a vegetarian recipe: it feels like the first time. is this really happening? could the poor man be losing his pork-obsessed mind? is the title of this post just a clever ploy to entice naive and starry-eyed vegetarians to read my blog? who is to blame for this sudden and terrifying turn of events? take a deep breath, and count backwards from ten. i’ll explain everything. i assure you, this is really happening. don’t worry, i am not throwing in my bacon grease stained apron. i still love meat and i will continue to love meat. that being said, i am happy to inform you that i made a tasty dish without meat the other day, and i have no regrets. i have my purplish-grey, stinky, rubbery friend konnyaku to thank for that. 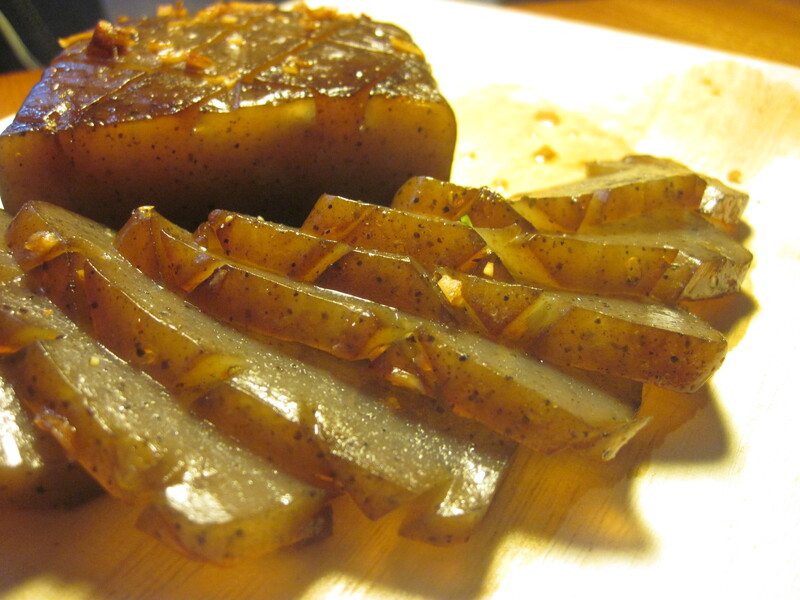 all it took to take konnyaku from a weird wiggly block of tuber jelly to a beautiful, savory, low-calorie treat was a flash boil, a quick marinade, and a few minutes spent over a frying pan. if any of that sounds interesting to you vegetarians out there, keep reading. i promise you won’t regret it.